The sample should be roasted within 24 hours of cupping and allowed to rest for at least 8 hours. Roast profile should be a light to light-medium roast, measured via the M-Basic (Gourmet) Agtron scale of approximately 58 on whole bean and 63 on ground, +/- 1 point (55-60 on the standard scale or Agtron/SCAA Roast tile #55). The roast should be completed in no less than 8 minutes and no more than 12 minutes. Scorching or tipping should not be apparent. Sample should be immediately air-cooled (no water quenching). When they reach room temperature (app. 75º F or 20º C), completed samples should then be stored in airtight containers or non-permeable bags until cupping to minimize exposure to air and prevent contamination. Samples should be stored in a cool dark place, but not refrigerated or frozen. The optimum ratio is 8.25 grams per 150 ml of water, as this conforms to the mid-point of the optimum balance recipes for the Golden Cup. Determine the volume of water in the selected cupping glass and adjust weight of coffee to this ratio within +/- .25 grams. Sample should be ground immediately prior to cupping, no more than 15 minutes before infusion with water. If this is not possible, samples should be covered and infused not more than 30 minutes after grinding. Samples should be weighed out AS WHOLE BEANS to the predetermined ratio (see above for ratio) for the appropriate cup fluid volume. Grind particle size should be slightly coarser than typically used for paper filter drip brewing, with 70% to 75% of the particles passing through a U.S. Standard size 20 mesh sieve. At least 5 cups from each sample should be prepared to evaluate sample uniformity. Each cup of sample should be ground by running a cleansing quantity of the sample through the grinder, and then grinding each cup’s batch individually into the cupping glasses, ensuring that the whole and consistent quantity of sample gets deposited into each cup. A lid should be placed on each cup immediately after grinding. Water used for cupping should be clean and odor free, but not distilled or softened. Ideal Total Dissolve Solids are 125-175 ppm, but should not be less than 100 ppm or more than 250 ppm. The water should be freshly drawn and brought to approximately 200º F (93ºC) at the time it is poured onto the ground coffee. The hot water should be poured directly onto the measured grounds in the cup to the rim of the cup, making sure to wet all of the grounds. Allow the grinds to steep undisturbed for 3-5 minutes before evaluation. No one test can effectively address all of these, but they have common aspects. It is important for the evaluator to know the purpose of the test and how results will be used. The purpose of this cupping protocol is the determination of the cupper’s preference. 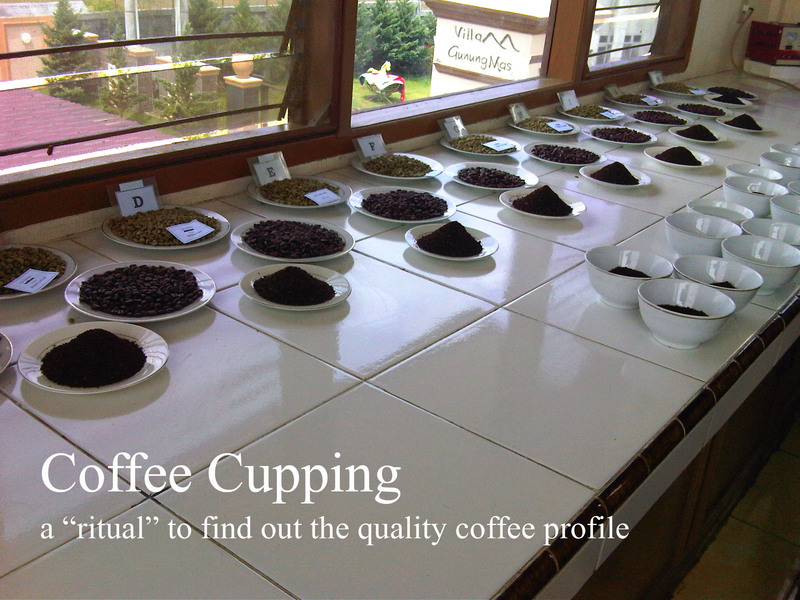 The quality of specific flavor attributes is analyzed, and then drawing on the cupper’s previous experience, samples are rated on a numeric scale. The scores between samples can then be compared. Coffees that receive higher scores should be noticeably better than coffees that receive lower scores. Theoretically the above scale ranges from a minimum value of 0 to a maximum value of 10 points. The lower end of the scale (2 to 6) is applicable to commercial coffees, which are cupped primarily for the assessment of defect types and intensities. Within 15 minutes after samples have been ground, the dry fragrance of the samples should be evaluated by lifting the lid and sniffing the dry grounds. After infusing with water, the crust is left unbroken for at least 3 minutes but not more than 5 minutes. Breaking of the crust is done by stirring 3 times, then allowing the foam to run down the back of the spoon while gently sniffing. The Fragrance/Aroma score is then marked on the basis of dry and wet evaluation. When the sample has cooled to 160º F (about 70º C, 8-10 minutes from infusion), evaluation of the liquor should begin. The liquor is aspirated into the mouth in such a way as to cover as much area as possible, especially the tongue and upper palate. Because the retro nasal vapors are at their maximum intensity at these elevated temperatures, Flavor and Aftertaste are rated at this point. As the coffee continues to cool (160º F – 140º F), the Acidity, Body and Balance are rated next. Balance is the cupper’s assessment of how well the Flavor, Aftertaste, Acidity, and Body fit together in a synergistic combination. The cupper’s preference for the different attributes is evaluated at several different temperatures (2 or 3 times) as the sample cools. To rate the sample on the 16-point scale, circle the appropriate tick-mark on the cupping form. If a change is made (if a sample gains or loses some of its perceived quality due to temperature changes), re-mark the horizontal scale and draw an arrow to indicate the direction of the final score. As the brew approaches room temperature (below 100º F) Sweetness, Uniformity, and Clean Cup are evaluated. For these attributes, the cupper makes a judgment on each individual cup, awarding 2 points per cup per attribute (10 points maximum score). Evaluation of the liquor should cease when the sample reaches 70º F (16º C) and the Overall score is determined by the cupper and given to the sample as “Cupper’s Points” based on ALL of the combined attributes. After evaluating the samples, all the scores are added as describe in the “Scoring” section below and the Final Score is written in the upper right hand box. On some of the positive attributes, there are two tick-mark scales. The vertical (up and down) scales are used to rank the intensity of the listed sensory component and are marked for the evaluator’s record. The horizontal (left to right) scales are used to rate the panelist’s preference of the particular component based upon their perception of the sample and experiential understanding of quality. The attribute score is recorded in the appropriate box on the cupping form. Fragrance/Aroma: The aromatic aspects include Fragrance (defined as the smell of the ground coffee when still dry) and Aroma (the smell of the coffee when infused with hot water). One can evaluate this at three distinct steps in the cupping process: (1) sniffing the grounds placed into the cup before pouring water onto the coffee; (2) sniffing the aromas released while breaking the crust; and (3) sniffing the aromas released as the coffee steeps. Specific aromas can be noted under “qualities” and the intensity of the dry, break, and wet aroma aspects noted on the 5-point vertical scales. The score finally given should reflect the preference of all three aspects of a sample’s Fragrance/Aroma. Flavor: Flavor represents the coffee’s principal character, the “mid-range” notes, in between the first impressions given by the coffee’s first aroma and acidity to its final aftertaste. It is a combined impression of all the gustatory (taste bud) sensations and retro nasal aromas that go from the mouth to nose. The score given for Flavor should account for the intensity, quality and complexity of its combined taste and aroma, experienced when the coffee is slurped into the mouth vigorously so as to involve the entire palate in the evaluation. Aftertaste: Aftertaste is defined as the length of positive flavor (taste and aroma) qualities emanating from the back of the palate and remaining after the coffee is expectorated or swallowed. If the aftertaste were short or unpleasant, a lower score would be given. Acidity: Acidity is often described as “brightness” when favorable or “sour” when unfavorable. At its best, acidity contributes to a coffee’s liveliness, sweetness, and fresh-fruit character and is almost immediately experienced and evaluated when the coffee is first slurped into the mouth. Acidity that is overly intense or dominating may be unpleasant, however, and excessive acidity may not be appropriate to the flavor profile of the sample. The final score marked on the horizontal tick-mark scale should reflect the panelist’s preference for the Acidity relative to the expected flavor profile based on origin characteristics and/or other factors (degree of roast, intended use, etc.). Coffees expected to be high in Acidity, such as a Kenya coffee, or coffees expected to be low in Acidity, such as a Sumatra coffee, can receive equally high preference scores although their intensity rankings will be quite different. Body: The quality of Body is based upon the tactile feeling of the liquid in the mouth, especially as perceived between the tongue and roof of the mouth. Most samples with heavy Body may also receive a high score in terms of quality due to the presence of brew colloids. Some samples with lighter Body may also have a pleasant feeling in the mouth, however. Coffees expected to be high in Body, such as a Sumatra coffee, or coffees expected to be low in Body, such as a Mexican coffee, can receive equally high preference scores although their intensity rankings will be quite different. Balance: How all the various aspects of Flavor, Aftertaste, Acidity and Body of the sample work together and complement or contrast to each other is Balance. If the sample is lacking in certain aroma or taste attributes or if some attributes are overpowering, the Balance score would be reduced. Sweetness: Sweetness refers to a pleasing fullness of flavor as well as any obvious sweetness and its perception is the result of the presence of certain carbohydrates. The opposite of sweetness in this context is sour, astringency or “green” flavors. This quality may not be directly perceived as in sucrose-laden products such as soft drinks, but will affect other flavor attributes. 2 points are awarded for each cup displaying this attribute for a maximum score of 10 points. Clean Cup: Clean Cup refers to a lack of interfering negative impressions from first ingestion to final aftertaste, a “transparency” of cup. In evaluating this attribute, notice the total flavor experience from the time of the initial ingestion to final swallowing or expectoration. Any non-coffee like tastes or aromas will disqualify an individual cup. 2 points are awarded for each cup displaying the attribute of Clean Cup. Uniformity: Uniformity refers to consistency of flavor of the different cups of the sample tasted. If the cups taste different, the rating of this aspect would not be as high. 2 points are awarded for each cup displaying this attribute, with a maximum of 10 points if all 5 cups are the same. Overall: The “overall” scoring aspect is meant to reflect the holistically integrated rating of the sample as perceived by the individual panelist. A sample with many highly pleasant aspects, but not quite “measuring up” would receive a lower rating. A coffee that met expectations as to its character and reflected particular origin flavor qualities would receive a high score. An exemplary example of preferred characteristics not fully reflected in the individual score of the individual attributes might receive an even higher score. This is the step where the panelists make their personal appraisal. Defects: Defects are negative or poor flavors that detract from the quality of the coffee. These are classified in 2 ways. A taint is an off-flavor that is noticeable, but not overwhelming, usually found in the aromatic aspects. A “taint” is given a “2” in intensity. A fault is an off-flavor, usually found in the taste aspects, that is either overwhelming or renders the sample unpalatable and is given an intensity rating of “4”. The defect must first be classified (as a taint or a fault), then described (“sour,” “rubbery,” “ferment,” “phenolic” for example) and the description written down. The number of cups in which the defect was found is then noted, and the intensity of the defect is recorded as either a 2 or 4. The defect score is multiplied and subtracted from the total score according to directions on the cupping form. The Final Score is calculated by first summing the individual scores given for each of the primary attributes in the box marked “Total Score.” Defects are then subtracted from the “Total Score” to arrive at a “Final Score.” The following Scoring Key has proven to be a meaningful way to describe the range of coffee quality for the Final Score.